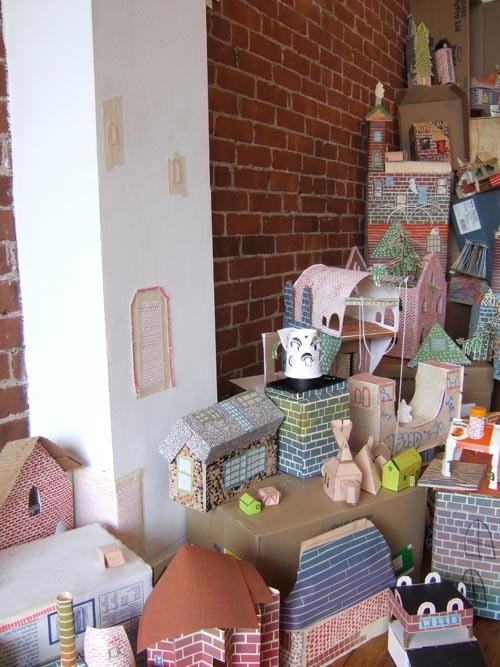 Andrew Oesch and Jean Cozzens have been building “Magic City Repairs,” mini metropolises of paper and cardboard at Providence’s Stairwell Gallery and Dirt Palace. As I said in my review, they’re a pair of Providence artists in the second-half of their 20s with the big idea that by inviting all comers to lend a hand cutting and pasting together a toy city they can help people feel like maybe, just maybe, they can have some say in the future of their world. 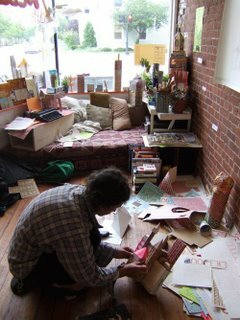 The Stairwell Gallery version (pictured here) is a work-in-progress that began with a waffles and glue-gun brunch-art-happening on May 27. Oesch and Cozens provided the raw materials, some 90 people (some pictured here) provided the labor. In the storefront window of Dirt Palace, where Cozzens lived for a couple years, the artists are building the cardboard city by their lonesome which will be on view through June 17. 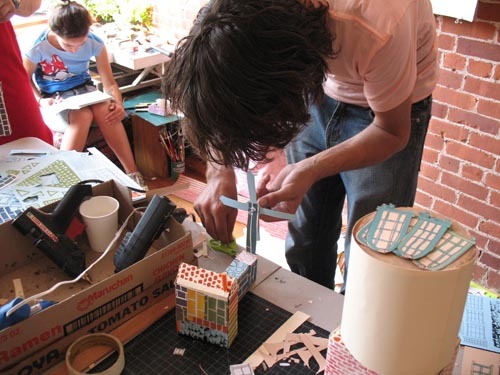 The two installations radiate verve and fun, which is an accomplishment, but I wish the ideas the duo is scratching at – ideas about how to get people engaged with the direction of their community – were more embodied in the end products. 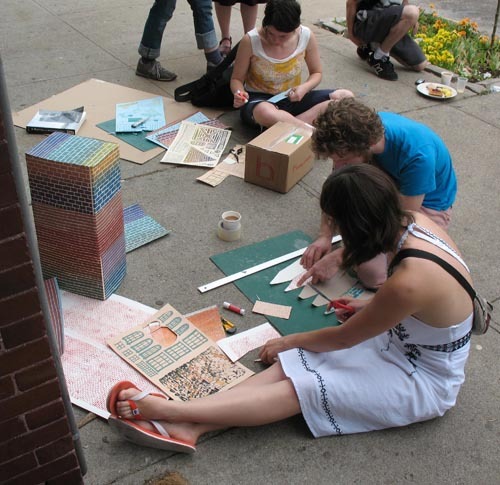 But ultimately the point is the process and collaboration – so to get the full effect, join the crowd at an art-making, city-building party at Stairwell Gallery from 11 a.m. to 8 p.m. June 14, with potluck dinner around 6. 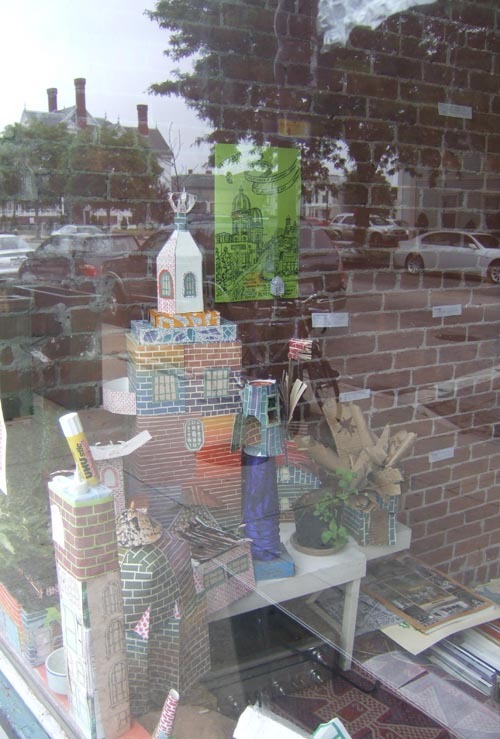 Jean Cozzens and Andrew Oesch, “Magic City Repairs,” Stairwell Gallery, 504 Broadway, Providence, May 27 to June 24, 2007. 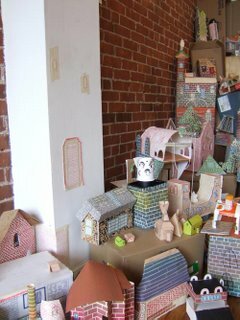 Photos by Cozzens and Carla Childs.